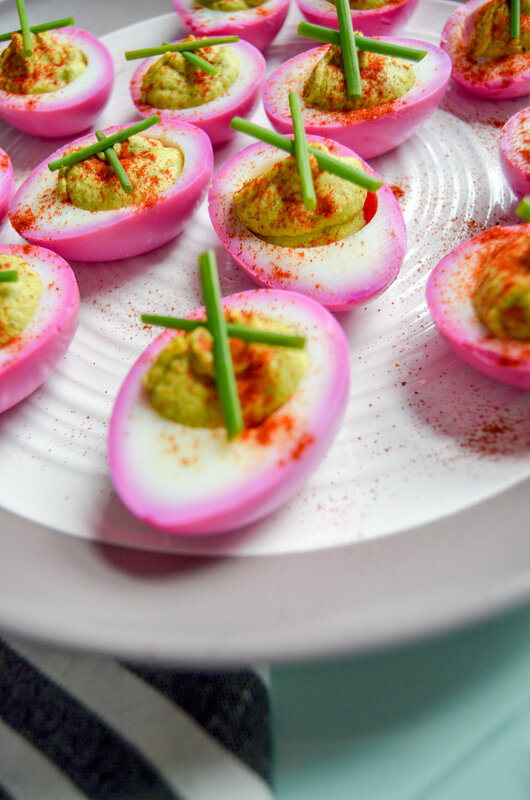 Made with avocado instead of mayonnaise, these healthy avocado deviled eggs are just as creamy and delicious without the guilt. They’re perfect for Easter or for an upgraded snack. Sprinkle with chives or dill and smoked paprika for garnish! Growing up as a child, my mother would make deviled eggs for every occasion; Christmas, Easter, you name it! But since I live in a different state from her, it looks like it's up to me to continue the tradition in my home! This recipe will be similar to my mother’s recipe but tweaked so it’s healthier for you. Eggs can get a bad reputation with the fat content but eggs actually contain healthy fats that are essential to overall health. Eggs are also a great source of protein as one whole egg contains six grams of protein. They are great from a culinary standpoint to help emulsify sauces or dressings and important in baking to add structure, leavening, and to enhance flavor. Speaking of healthy fats, a great whole food alternative to mayonnaise is using avocado instead! An avocado provides just a quarter of the calories mayo does along with healthy fats, fiber, and important vitamins like folate and Vitamin C.
Since I absolutely love deviled eggs, I thought I would kick up the game a little bit. You can completely omit this part (why would you!?) but these eggs are beet-dyed! Dying the eggs are merely for presentation. The beet dying process does not affect flavor at all! If you would like to give your eggs this pretty color, check out the Created by Diane blog post on beet dying. I followed her foolproof method but used the juice from my Refrigerator Pickled Beets recipe instead, to cut out some steps. 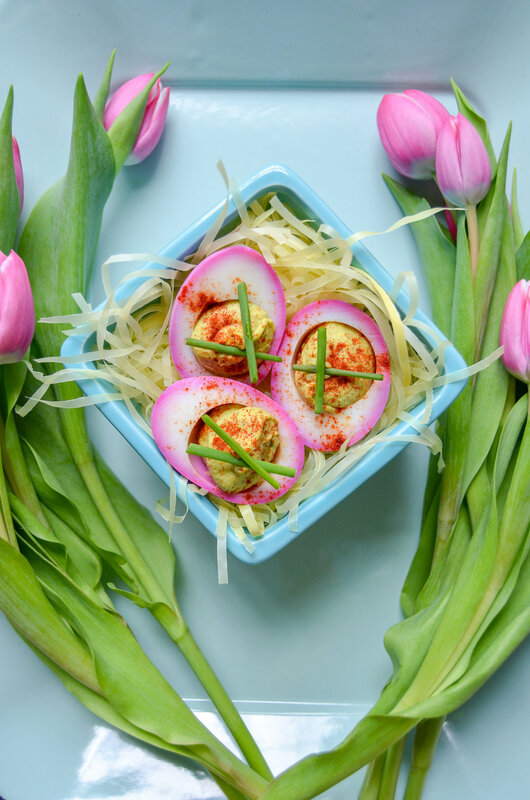 Enjoy these not so devilish eggs as a quick protein snack or as an appetizer to share this Easter holiday, picnic or barbecue. To hard boil the eggs: Place 12 eggs in a large saucepan with cold water until eggs are fully covered. Set the oven on medium heat and let the water boil gradually (this prevents the eggs from cracking if set on high). Once boiling, cover with a lid and sit on the back burner for about 11-13 min (depending on the size of your egg). When the eggs are cooked, immediately transfer eggs to an ice cold water bath to stop the cooking process. Gently crack shells to remove the egg. Slice eggs in half and remove eggs yolks saving 4 egg yolks (8 halves) and add to a bowl. Discard or keep remaining yolks for another dish. For this filling: add avocado, pickles, dijon mustard and seasonings to the bowl with yolks and mash until fully incorporated. Adjust seasonings to taste. It is best to use the back of a fork for easy mashing. To serve: place filling in a ziploc bag and cut one corner to squeeze the filling into the hollowed part of the egg. Sprinkle with smoked paprika and top with chopped fresh chives or dill. Store in an airtight container for up to 1 week and enjoy! The egg and avocado mixture should fill exactly 24 halved eggs but just in case you might have used a small avocado, add more egg yolk to the mixture to ensure you have enough filling for 24 halved eggs.